American electronics company Spectravideo started out making games in the early 1980s before branching out into creating computers and peripherals (including the interesting Compumate for the Atari 2600). 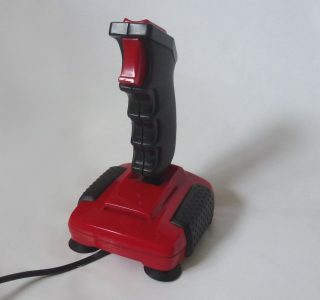 They were probably best know however for their popular range of Quickshot joysticks. The Quickshot 2 Turbo was released in 1985 and sported a striking red and black livery. It featured two fire buttons, one on top of the grip and one in the index finger trigger position. It also had a secret weapon, the appealing but often ineffective ‘Auto Fire’ option. You now no longer needed to concern yourself with the rigours of pressing the fire button, the joystick did it for you. Cheats sometimes do prosper, but not often when using the Quickshot 2’s auto fire mode. 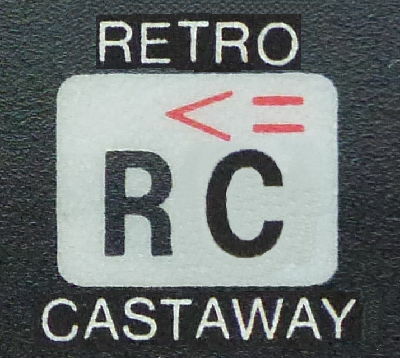 To engage this mode you used the black slider switch on the back of the stick base which even featured a special selection especially for the troublesome Amstrad CPC464. As it turned out this feature was often more trouble than it was worth especially in games where ammunition was restricted or you could only fire one shot at a time and had to carefully aim each round. The stick featured the reliable but noisy micro-switch style contacts that resulted in frantic gaming sessions sounding more like a hail storm on a tin roof. It was however satisfying and responsive to use feeling more robust than some of the dome contact sticks that were prevalent at the time. A sad sight. An unstable, sucker-less Quickshot 2. It also came with 4 suction cups on the bottom of the base allowing you to stick it to that shiny A4 Roland Rat annual your Aunty got you for Christmas (that you never read). Once mounted in this way it could be placed on your lap and easily steadied with your non-playing hand giving you that all important edge in games of Match Day 2. 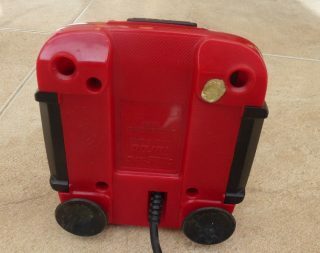 Sadly these suction cups were prone to detaching themselves and getting lost, you could get away with losing one but any more and your book sticking days were over. We’ve fond memories of the Quickshot 2 Turbo forged during hours of space travel in Elite and frantic games of Sensible Soccer. Our stick still works a treat (lost suckers aside) and the contacts still feel as responsive and loud as ever. If you want to pick up a Quickshot 2 Turbo then they can be found on eBay and from specialist retro gaming suppliers. They cost around £12-£15 each depending on condition with boxed examples commanding a higher price.